The natural world often provides the answer to unsolved medical problems. On this occasion, the solution to a challenge posed by cancer has come about from the immune system of camelids. A study headed by the Institute for Research in Biomedicine (IRB Barcelona) and the Vrije Universiteit Brussel (VUB), in Belgium, describes a number of therapeutic tools that have the capacity to block the activity of EGF, a growth factor that is dysregulated in cancer cells. EGF (Epidermal Growth Factor) is a therapeutic target in cancer; however, no inhibitors have been found for it to date. The team of researchers is the first to identify a family of nanobodies–antibodies that are exclusive to camelids–derived from alpacas that are effective against EGF. In this regard, they have described the molecular mechanisms underlying the affinity and selectivity of these nanobodies in an article published in the scientific journal Angewandte Chemie. IRB Barcelona produced the EGF protein and their Belgian colleagues administered it to alpacas. The immune response of these animals to this strange antigen produced a series of nanobodies, and the researchers identified a family of these molecules as potential inhibitors of EGF. The IRB Barcelona team, which has extensive expertise in molecular recognition between proteins, observed that some of the ligands showed high affinity and selectivity towards EGF, and, using a range of biophysical techniques, they characterized the interactions in cells in vitro and in human cancer cells. 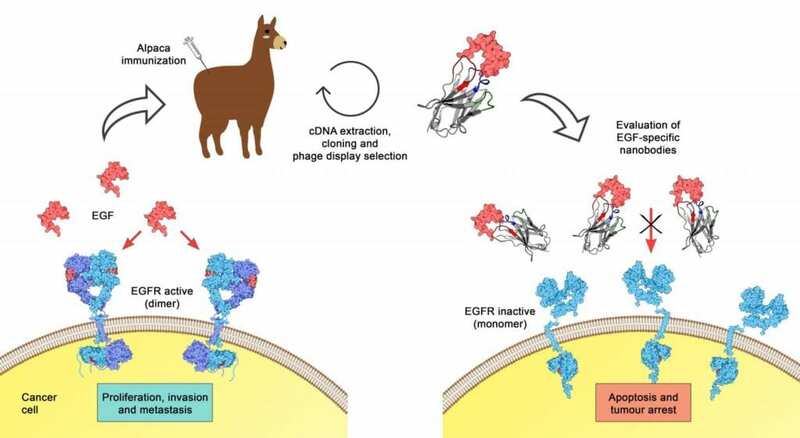 "By injecting EGF into the alpaca we have challenged nature to find a molecule capable of binding tightly and with high selectivity to EGF, and it has come up with two very different but equally effective solutions for such a small and difficult antigen as EGF," says Ernest Giralt, head of the Peptide and Proteins Lab at IRB Barcelona and senior professor at the University of Barcelona, who has led the study. These drugs could be useful for patients who develop resistance to the EGFR inhibitors currently on the market. The first step is now to evaluate the pharmacological effect of these new nanobodies in cell and animal models of cancer. The study has been done in collaboration with Serge Muyldermans' team, at the Vrije Universiteit Brussel (VUB) in Belgium and has received funding from the Ministry of Science, via ERDFs, and the Catalan Government. Created in 2005 by the Generalitat de Catalunya (Government of Catalonia) and University of Barcelona, IRB Barcelona is a Severo Ochoa Centre of Excellence, a seal that was awarded in 2011. The institute is devoted to conducting research of excellence in biomedicine and to transferring results to clinical practice, thus improving people's quality of life, while simultaneously promoting the training of outstanding researchers, technology transfer, and public communication of science. Its 25 laboratories and seven core facilities address basic questions in biology and are orientated to diseases such as cancer, metastasis, Alzheimer's, diabetes, and rare conditions. IRB Barcelona is an international centre that hosts 400 employees and 32 nationalities. It is located in the Barcelona Science Park. IRB Barcelona forms part of the Barcelona Institute of Science and Technology (BIST) and the "Xarxa de Centres de Recerca de Catalunya" (CERCA).